I just received this ring via FedEx and it was absolutely GORGEOUS! ! I'm extremely impressed with the attention to detail the artist did. Thank you, Thank you, Thank you!! I will definitely keep ordering items from you. 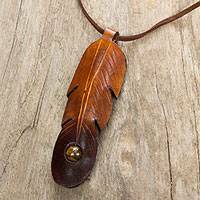 Brown Leather Feather Pendant Necklace with Tiger's Eye, "Feather Spirit"
Tigers' Eye Cuff Bracelet in Leather Handmade in Thailand, "The Power"
This adjustable cuff bracelet features smooth leather and five tiger's eye beads. 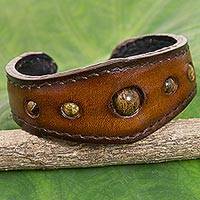 The bracelet is handcrafted and designed by Thailand artisan Chaloemphon. Whatever the setting, tiger eye jewelry is perfect for any occasion. The golden brown stone possesses a unique characteristic called chatoyancy, that is, a changeable luster or color with an undulating narrow band of white light. It is not faceted, but polished to showcase this beautiful feature of the natural gem. 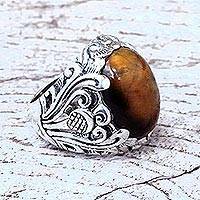 Believed to bring prosperity, tigers eye is perfect for people in need of more confidence to accomplish their goals. Roman soldiers wore it, engraved with symbols, to protect them during battle. 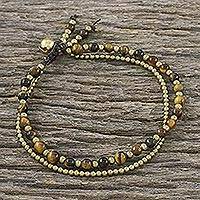 In addition to making citrine bracelets, Peruvian artist Magda loves to use unusual stones like tiger eye. It's mysterious qualities add to the depth of her lovely pieces. 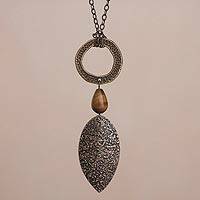 Slightly difficult to find in Thailand, Lilly Rahmann also loves to use tiger's eye in her pieces. 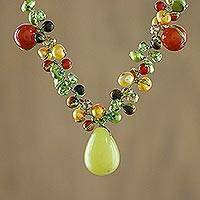 She generally uses this stone in her pearl necklaces which add a special touch. 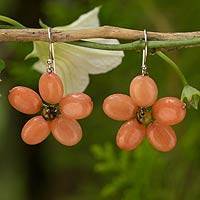 Lilly also creates unique drop earrings and jewelry sets. Come and enjoy our amazing tigers eye jewelry collection!